The In-Circuit DW1000 High Resolution Positioning-Serie (HRP) is a real time localization system (RTLS) based on the Decawave DW1000 Ultra Wideband (UWB) Low-Power Transceiver. It is not based on the DecaWave-DW1000-SW-Stack and by utilizing Two Way Ranging (TWR) instead of double sided-TWR (DS-TWR) we archive much higher position refresh rates with the same number of devices. The In-Circuit DW1000 High Resolution Positioning Stick (HRP) represents the heart of the system. It combines the Decawave DW1000 Ultra-Wideband (UWB) Transceiver with the STM32L151CC microcontroller and a UWB-chip Antenna. Furthermore it contains a temperature compensated crystal oscillator for highest precision and a CP2102 USB-Bridge for serial data transfer. The Stick comes with the In-Circuit HRP-Firmware installed and is ready to use. Depending on the configuration, the Stick can be used as both, anchor and tag. A base system consists of four Sticks (1x master-anchor, 2x slave-anchors and 1x tag). Such a base system, including a free demo of our HRP software can be purchased in our online shop. The demo version is capable of handling up to four anchors and up to four tags. In this configuration a position update rate of up to 100 Hz and an accuracy of down to 2 cm can be archived. The HRP protocol supports up to 180 devices (anchors or tags). The In-Circuit HRP system is not based on the DecaWave-DW1000-SW-Stack. By utilizing Two Way Ranging (TWR) instead of double sided-TWR (DS-TWR) we archive much higher position refresh rates with the same number of devices (tags&anchors) and comparable accuracy. 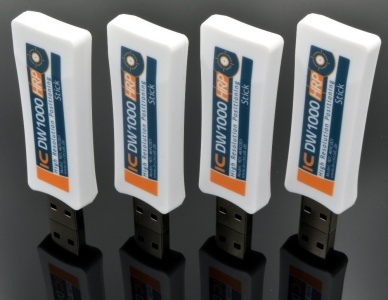 The DW1000 HRP Tracker V1.0 Demo Software supports up to 4 anchors and 4 tags. To operate 2D-ranging, at least four devices are required (3 anchors & 1 tag). The DW1000 HRP Tracker Demo Software will not start 2D-ranging with less than three anchors defined in the device menu. Nevertheless it can be used with a minimum of two devices (1 anchor and 1 tag). The module configuration menu offers the possibility to define dummy devices to reach the minimum anchor quantity of three. With only two devices (1 anchor & 1 tag), two dummy anchors need to be defined to enable ranging. To define the dummy anchors, enter the Module konfigurieren menu and add two dummy devices by hitting manuell hinzufügen twice. The dummy devices are automatically added as anchors with default ID 0. With less than 3 anchors defined, the program only draws distance circles in ranging mode and does not draw discrete tag positions since their interpolation is not unambiguously possible with less than 3 measured distances. Furthermore it will display the distance between the master anchor and the first tag in the down-left corner of the main window.